Since no reasonable person is clamoring for more reviews of games from a two-decade old handheld system, let’s do another one! Tonight, it’s Joust. 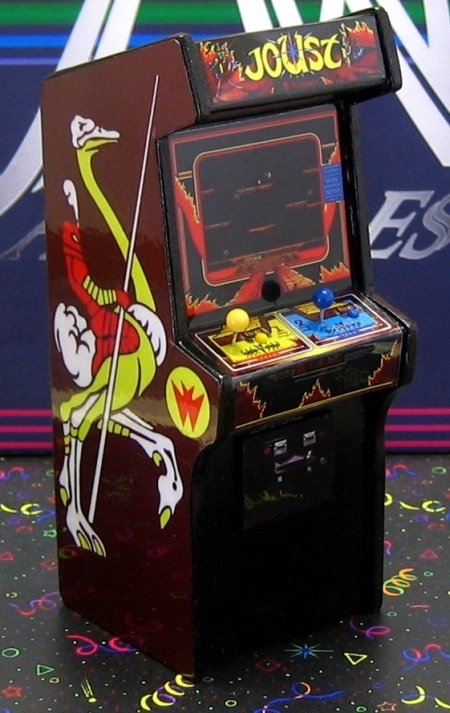 Famously conceived by Williams Electronics in 1982 as an arcade alternative to the usual spaceship theme (Asteroids was big at the time), this game was programmer John Newcomer’s baby. According to my friend Rob, Mr. Newcomer also worked with Python Anghelo, the man behind the alarming and wonderful Bride of Pin-Bot, probably the strangest pinball machine ever (which you can play over at Zanzabar if you’re a local). You know the one, the table with the creepy Cylon voice where apparently the goal is to finger-bang the flippers around until the power of your metal balls can turn the moaning machine beneath you from a cyborg into a human female (the plot of the Battlestar Gallactica reboot decades early!). It all makes sense when you play it, or not (“My God, she’s alive!”). But, yeah, Anghelo is the guy who designed those memorable knights and ostriches and vultures on the cabinet that catch your eye from a distance. Sort of looks like Bakshi’s Wizards, huh? And storks! You can ride storks, too, if you’ve got two players doing the co-operative game-play thing. On the Lynx, this means you’ll have to hook up the “ComLynx” cable. 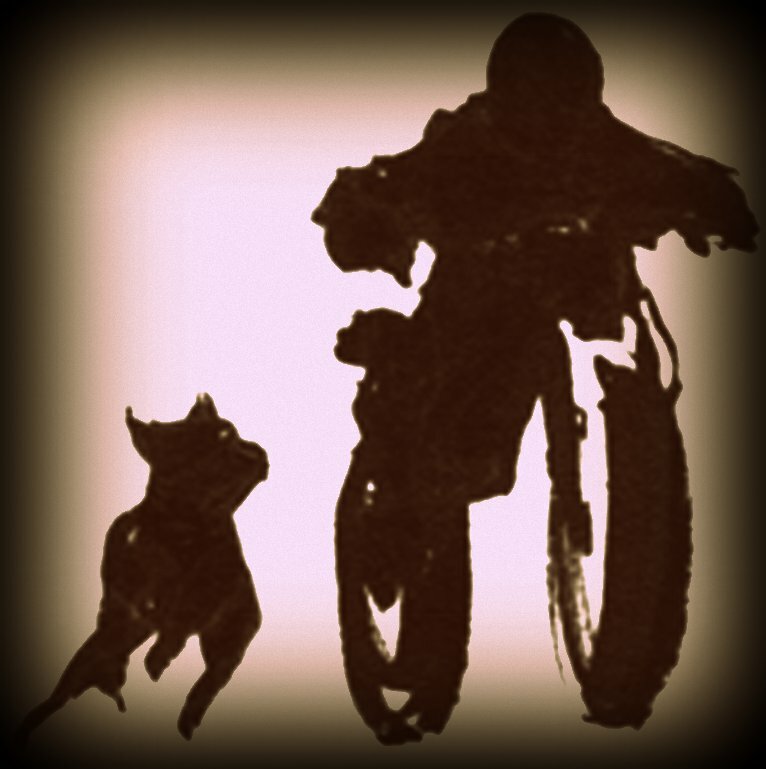 But then, of course, you’ll also need two Lynxes, as well. 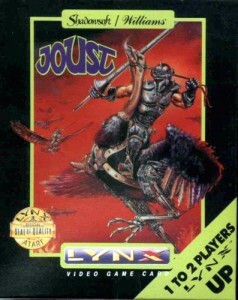 And two copies of Joust. And two people who like to double-up on equipment just to play one game on a two-decade-old game system. In other words, just like children who were lied to about where babies come from…you’ll never see any storks. Neither where storks nor where babies come from. I just told you! You flap! Yeah, no other “real” weapons to speak of, except for your lance, of course. But that doesn’t really do anything. Either end of your ostrich simply has to make contact while flying higher than the enemies in order to defeat them. So learning to fly is learning to kill. Kind of like Top Gun. Except you don’t accidentally kill a Goose. You kill some vultures! See below. Bounder: Supposedly, these knight are riding nasty vultures while you ride a noble ostrich, but they look just like red versions of you (you’re like a baby-blue hue). Bop them on the head. Hunter: These look like gray versions of you, maybe a little faster on the flap. Bop them on the head. Pterodactyl: Last seen in the movie WarGames, where the heroes shrugged off the fact that a prehistoric beast was not only still alive, but under the radio control of a madman! Fossilized remains, courtesy of the Smithsonian Museum of Natural History. This pesky thing comes out when you take too long to clear a level (or later during the second Survival Wave, where the screen begins with one already zipping around and screeching), and it’s impossible to kill without a perfectly placed stab in the beak. It doesn’t matter if you’re positioned higher when you strike, it has to be a well-timed hit or you’re killed instantly. Therefore, they’re best avoided or you’ll get the dreaded “Thy Game Is Over.” There is a bit of a trick to killing them, and I’ll get to that below in the “strategy” section. They also slowly but relentlessly target you and you alone. So work fast to clear the screens. 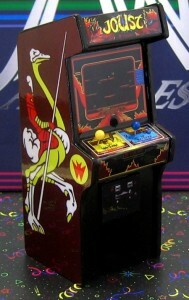 Flap, you fools! And maybe during the Egg Wave you should clear the eggs from the top down so any that do hatch will have to mount their feathered beasties on the bottom of the screen instead of the higher platforms. This will give you a slight advantage, as higher is always better. Just ask Cypress Hill. They mostly just look like engorged mosquitoes. Also, I recommend spending every waking moment you can on the right side of the screen, just above the platform that generates enemy combatants. Not only can you bop them on the noggin the instant they get beamed into the arena, their maiden voyage will tend to fly their noggins perfectly into position for said bopping – it’s very common for a steady stream to continuously fly off the left side of the screen, then reappears right under you. Once those platforms disintegrate in the later levels, however, your best best is to constantly hover right in the upper center of the screen. The bottom of the screen means death. Don’t linger down there. The only reason to hang around anywhere near the bottom is when a pterodactyl is buzzing the ground (or maybe to make the cool tire-screeching noise with your birdy feet). 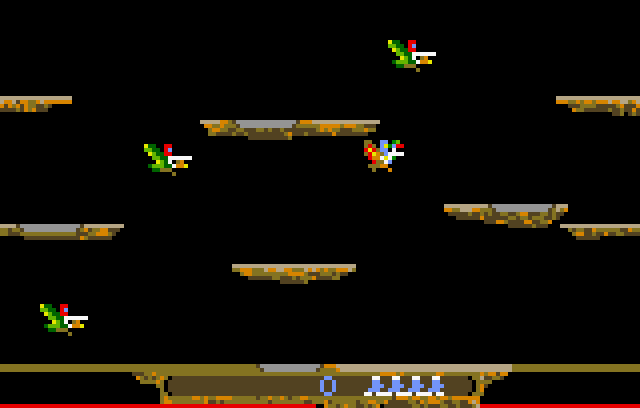 If you’re standing on the ground while facing the pterodactyl, flap once and tap your lance on its beak. 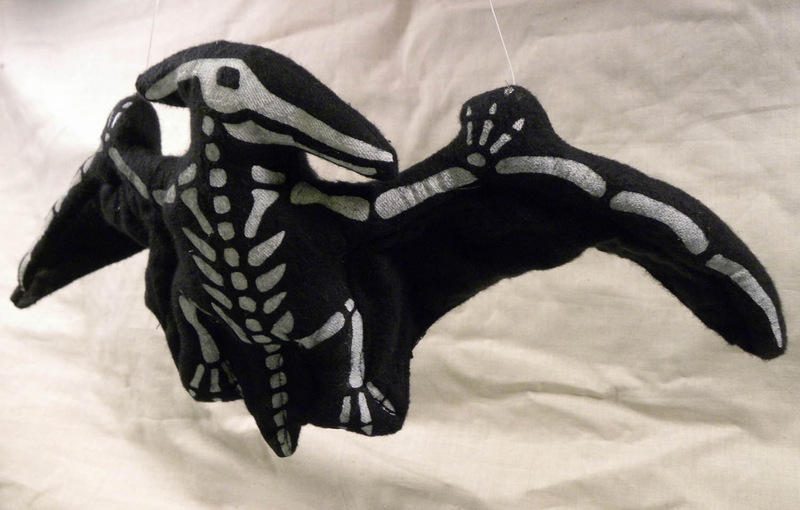 Do this right, and the pterodactyl will be destroyed in a strange vibrating death dance. It’s a hard shot to master, but near the ground, the odds seem to be higher when you start off standing and line up your lance like this (unless you’re in an arcade and the glitch up there is still working, of course). So I guess I lied earlier when I said the lance did nothing. I can’t be trusted! But don’t get too excited about the above YouTube video. It’s gonna be fixed. So, in conclusion, if you see this creature anywhere else on the screen besides the bottom, treat it like you would in the real world. Run. I mean, flap! This game is at Zanzabar, too! Wait, another World Record Atari Lynx score, you say? Okay, maybe that’s a little exaggeration. 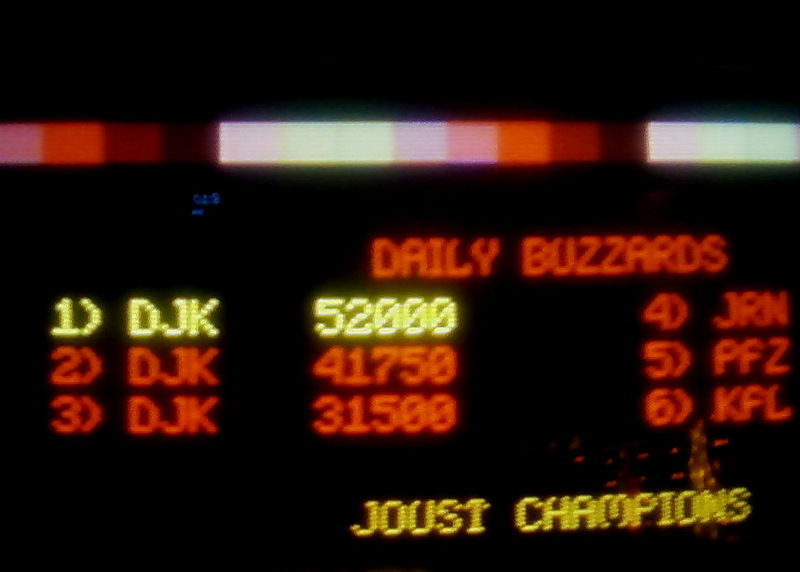 But, seriously, even though I can only ever get on the Daily Buzzard screen on the arcade version, according to the internet (which never, ever makes mistakes) I am the Joust Supreme World Champion on the space-age Lynx Machine! I’m telling you, I searched and searched, and I keep coming up with the same record score by the same dude. Oh, and some puny 60,000ish scores that some other people were crowing about, too, for some reason. Hell, I get 60,000 points before my cornflakes get soggy. So until someone else starts playing Joust on the Lynx again, my record score is going to be etched in internet stone (not stone at all). Check out my proof below that would stand up in any courtroom. Jason C. Dove had a bird in his name, but it wasn’t enough to keep his talons on the trophy.